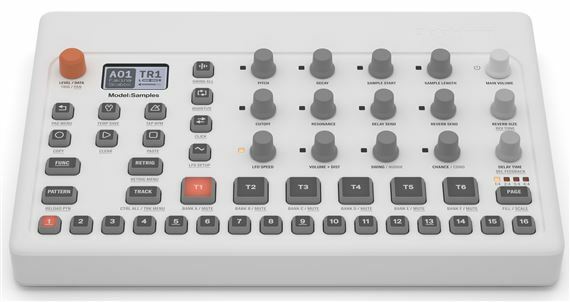 Order your Elektron Model Samples Sampling Production Workstation from AMS and enjoy 0% Interest Payment Plans, Free Shipping, Free Extended Warranty & 45 Day Money Back Guarantee. Compact and lightweight, the Model: Samples makes creating rhythms a breeze with straightforward operation and the controls are right at your fingertips. Model:Samples is a six-track sample based groovebox that packs a powerful punch and also fits into your backpack. Model:Samples ships with loads of pro quality samples and patterns to get you started—and has more than enough space for your own creations. Model: Samples ships with 300 preset sounds curated by Splice.com, ranging from essential kicks, snares, and hi-hats to exotic, never-before-heard effects and strikes to chart new rhythmic waters. With a few quick tweaks, you can perfect and personalize any sample so it sounds just the way you want. Use any of the expertly crafted custom sound packs included, or easily drop your own samples into it with the built-in microUSB port. Model: Samples features our most complete set of front panel controls, each function with its own knob. They're all right there; just grab a knob and twist it. Unleash your music spontaneously using the durable velocity-sensitive pads. Record your every move live, or design your rhythmic creation in detail using the superb Elektron sequencer.